In the country side fish are continuously on the search for feed. In a pond feeding too much in one time will result in pollution of your pond. A solution for this problem is an automatic fish feeder. The fish feeder drops on fixed times a small amount food in the pond. Cause pond fish eat just small amounts in one time and the feed they do not eat, may become additional waste material in your pond. Which can lead to being a burden for the biological equilibrium. This will lead to, for example, algal growth and turbid water. A stock of fish, having constant growth is achieved by feeding measured amounts several times a day. Especially during holiday seasons and in less favourable weather conditions fish will be ‘forgotten’ sometimes. This problem can be solved by using an automatic fish feeder. 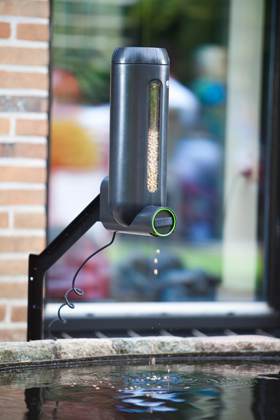 An automatic fish feeder has been developed especially to distribute certain amounts of feed wanted several times a day. During holiday seasons and also in all weathers your fish will be daily insured of a regular and constant amount of feed. As the feed is consumed, pond environment will not be additionally burdened. Certainly for lovers of koi carps sophisticated feeding of the fish in question is of importance to achieve optimum colouring and constant growth. As soon as in autumn outside temperature will go down, fish need less feed owing to their low energy consumption. In this period you should reduce the amount of feed. A soon as the temperature of the water reaches 8°C or lower the automatic fish feeder near the pond can be removed. At these low temperatures you only have to distribute a certain amount of winter feed 1 or 2 times a week by hand.